History: Parvathi Devi performed Tapas in this sthalam to marry Shiva Perumaan and finally got married in this sthalam and because of this the sthalam is called as "Thiru Manancheri".Thirumanancheri temple is where the divine marriage of Shiva and Parvati took place, and today, people flock to this temple, praying for an early marriage, thanking the lord for their marriage, and praying for children. There is yet another speciality about this sthalam. One among the form of Lord Shiva is Arulmighu Dhakshina moorthy in Yoga ( in deep tapas) form and to get him out of that tapas, Manmadhan, the got of love threw an arrow of flower on Shiva Perumaan; Lord Shiva opened his 3rd eye from the forehead and made Manmadhan into Ash; Rathi devi wife of Manmadhan requested Lord Shiva to get her husband back and got him in this Thirumananchery Sthalam only. Yet another special attraction of this temple is the Posture of Shiva Perumaan in the form of 'Sri Kalyana Sundarar' in the beautiful 'Marriage pose' along with Ambal. It is said that if we perform special poojas for Gokilambal sametha Sri Kalyana sundar by offering him with the Garland, all the hurdles in our marriage gets cleared and the marriage takes place very quickly.The Lord Kalyanasundarar stands as bridegroom and blessing the devotees. 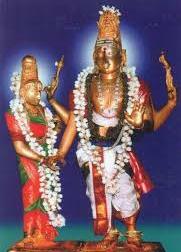 The Goddess Kogilambal seen the foot steps of the Lord by bowing her head with shyness. We can see such as glorious scenes only at this place. And also the Lord gave 'Mangalya Pichai' to the 'Rathi Deve' and combined the both 'Manmathan and Rathi Devi' in this place. The 'married couples' who were separated from their married life for various resons may also come and pray the Lord Kalyanasundara for their 'unity'. This kind of prayer is also conducted in this temple. It is said that if we perform special poojas for Gokilambal sametha Sri Kalyana sundar by offering him with the Garland, all the hurdles in our marriage gets cleared and the marriage takes place very quickly. Have the garland tied inside a small bag and keep it in the pooja room. Once the marriage is fixed, along with your wife/husband, dedicate the garland towards the temple; and the prarthanai is completed in this manner. After the Marriage the Couple have to visit the temple to return or dispose the Prasatham in the Temple pond. Another speciality of this temple is by offering the milk payasam towards mangala Raghu on every no moon day (amavasai) will gives the' puthra baghyam '. Travel Information: This temple is located 15km from Mayavaram nagapattinam district. Contact : The Executive Officer, A/M. Uthvaganatha Swamy Temple,Thirumanacherry - 609 801. Mayiladuthurai Taluk. Nagapattinam District.